What is my blog turning into? Another post about gourmet donuts? Yes, it's true...I love all sweets! And I feel it's my duty to give guidance on other delicious treats besides cupcakes. 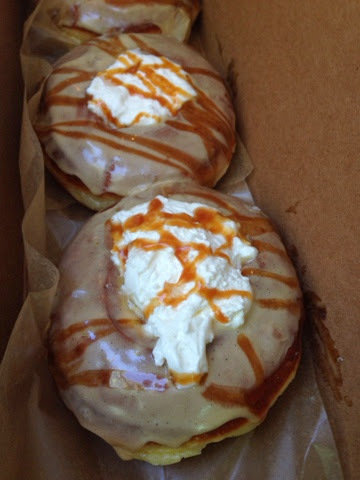 Have you been to Sidecar Donuts in Costa Mesa, CA? It's another amazing gourmet donut place, which translates into $3 a pop donuts (but so worth it). I recently ventured into their shop and picked up a few donuts for a business meeting. The donut of the day was Butterscotch Pot de Creme ($3.50). It's a donut topped with butterscotch cream, homemade creme fraiche, caramel, and Jacobsen sea salt. So delicious! But better than a cupcake?...let's be serious.